Gerry from Infodesign in Australia sent us this great - and visionary considering the situation in Australia - example of how Sydney is putting some thought and money into promoting A2Bism as a way to encourage cycling in the city. Cycleways - To get us all home faster. More bikes. Less traffic. 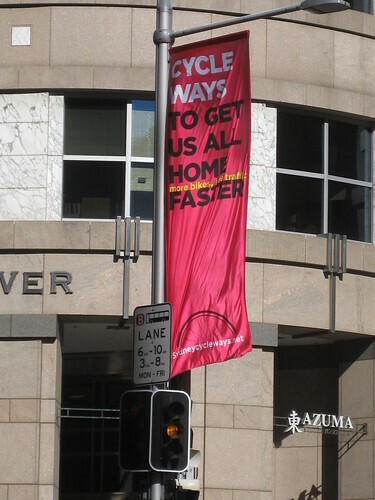 Check out the Sydney Cycleways website to see examples of other rather interesting slogans in use for the campaign. All and all it looks like a refreshingly modern and progressive campaign. Far from the traditional bike advocacy stuff you see. A great approach to sell the idea of infrastructure - and bicycle transport in general - to the broader - and sceptical - population.